Organizations like National HealthCare Corporation and PruittHealth continue to join the growing list of leading LTPAC providers that are upgrading to MatrixCare for better interoperability, ease of use, analytics, service, long-term vendor stability and overall outcomes performance. MatrixCare is proud to be a sponsor of the LeadingAge Conference and invites you to stop by Booth #1227 to learn more about what upgrading to the better technology solution can do for your long-term care organization. Plan to join us in the Expo Hall for refreshments, demos, prize giveaways, lively conversation and more! Monday, October 29, 2018 | 11:30 a.m. – 3:30 p.m.
Tuesday, October 30, 2018 | 12:00 p.m. – 3:30 p.m.
Wednesday, October 31, 2018 | 9:30 a.m. – 11:30 a.m. The first 25 attendees who register for a demo will receive a FREE Amazon Echo Dot once the demo is complete on-site. 1. Scheduling and attending a live demo during the show. We’re moving healthcare forward with advancements in our LTPAC technology solutions and invite you come check out what’s new. 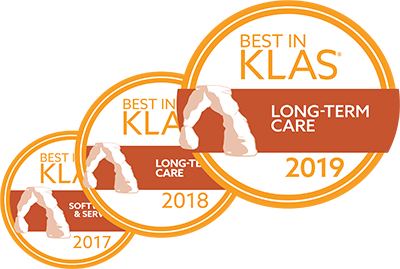 Also, we’d love to show you our MatrixCare core products that helped us earn the title of Best in KLAS for Long-Term Care Software in 2017 and 2018. Take a break! Drop by Booth #1227 and indulge in a beverage or two on us while you take a minute to soak in all the activity at the event. Monday, October 29th | 6 p.m.-7:30 p.m.
Join us from 6-7:30 p.m. in the heart of the Old City at LaPeg, a contemporary American brasserie featuring views of the Delaware River and Ben Franklin bridge. You’ll enjoy an eclectic evening that mixes the old and new with delightful appetizers and libations. You need not be an existing customer to join us at this event—the more the merrier. Who are the founders? Those who recognize that the future of LTPAC is built on a solid foundation of innovative technology and engaged staff—in other words, MatrixCare and OnShift customers! Sunday, October 28, 2018 | 3:30 p.m. – 5:00 p.m. Learn more about building a strong antibiotic stewardship program for your skilled nursing facility. Understand how the core elements of the CDC antibiotic stewardship program provide a framework for skilled nursing antibiotic activities. Consider data elements that can be used to calculate antibiotic use measures that are feasible, most accurate and actionable. Distinguish the roles and responsibilities of prescribers, pharmacists and nurse leaders within an antibiotic stewardship program. Monday, October 29, 2018 | 3:30 p.m. – 5:00 p.m. Learn more about how MatrixCare is training neural networks with artificial intelligence and the Microsoft Azure Deep Machine Learning Studio to improve the cost and quality of care among senior living residents. Hear how EHR solutions are beginning to incorporate artificial intelligence and deep machine learning to guide personalized care decisions. Learn how MatrixCare is leveraging machine-learning toolsets to help maximize both the patient experience and quality-of-care outcomes. Discuss how increases in the capability of top-tier cloud computing to manage big data are paving the way for innovation. One winner from each social media platform will receive an Amazon Echo Dot. Winners will be announced via social media and notified by email. Complete prize rules are available here.